Jesus didn’t tell me to only love those who love me. 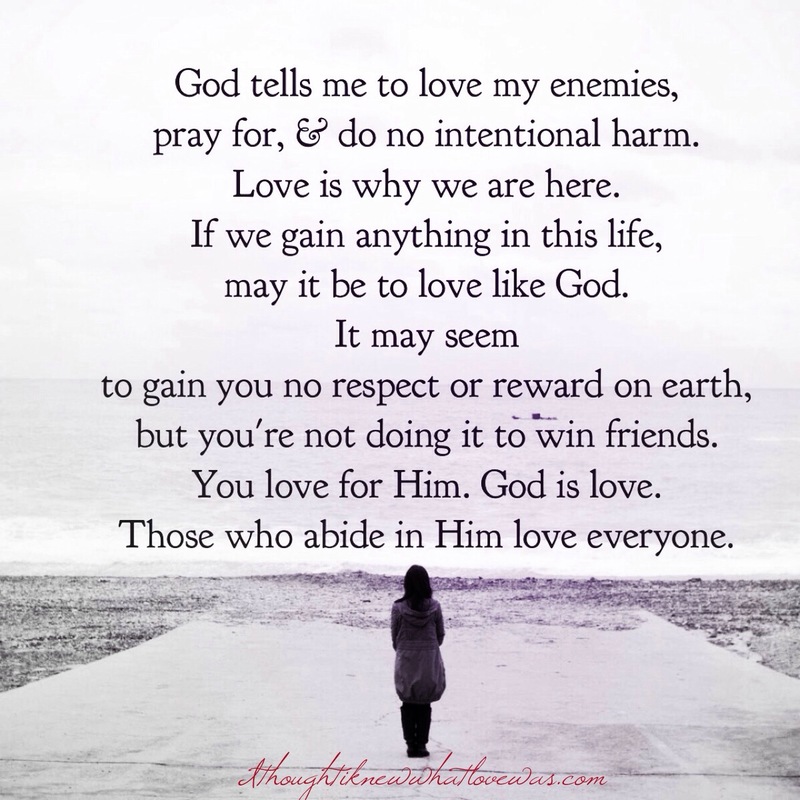 He told me to love everyone, “…love your enemies & pray for those who persecute you, that you may be children of your Father in heaven,”~Matt 5:44-45. The person who doesn’t love does not know God, because God is love,~1 John 4:8. God is love. And I’m not talking about the Christian love we do of telling people we love them with flowery words, yet our actions do not demonstrate God like love. How does God love you? That’s the love He asks and commands us to give others. I’m not perfect in this area. No one other than Jesus got this right, yet throughout the Gospels God repeats Himself, “Love! Love! LOVE one another!” Jesus told the disciples the world would know we were following Him by our love for one another. We cannot claim to love God and hate people. We cannot claim to truly be following Jesus and withhold love from people. It’s ungodly-not like Him. What if God didn’t forgive us and wipe our slates completely clean? What if God kept bringing up our past sins and rubbing them in our faces? What if God was impatient and without compassion? What if God only dealt with the people who were really good to Him and loved Him well? What if God treated us the way we treat people? What if God was stingy and rude? What if God chose to one day hold grudges? What if God completely ignored us though we were repentant or offered Him love? What if God only showed up when love suited His best interests? What if God never supported, encouraged, helped, or invested in us? What if God ignored our needs because He was too busy or we were too needy? What if God only showed up when He needed something? What if God was like us? We are called and empowered to love. It’s not optional for a follower of Jesus. It’s not something we bypass and slide into heaven. God is serious about love. He doesn’t ask us to be God for people, only He can meet people’s needs completely. He does call us to reflect Him and point to Him. He does call us to obey Him. We confess the sin of being unloving and disobedient and we repent (turn from it). We forgive ourselves and others for being unloving. If we don’t forgive, we are not forgiven. We invite the Holy Spirit to give us His eyes for people and His heart. We abide in the Vine. If you have no personal relationship with Jesus Christ, there’s no way to abide in Him or have salvation. We obey God. Obedience to God has never been optional though some teach it is. Jesus never taught that we could live as we please and somehow honor God. He states, “I’d rather you be hot or cold than lukewarm, lest I spit you out.” The Bible states obedience is better than sacrifice. We don’t obey to gain love or approval or righteousness. We obey out of love for God. If we don’t obey Him, we don’t love Him. It doesn’t mean He doesn’t love us. We let God love us so we have love to give. We cannot give what we haven’t received. While we were still sinners, Christ died for us. His mercy is new every morning. Father forgive me and us for our lack of love for others. Teach us to love like you. May we be imitators of God as dearly loved children. Give us your eyes for others and ourselves. May we be known by our great love, compassion, generosity, faith, forgiveness of others, mercy, and goodness. May we overflow with good fruit. A sweet fragrance and bright light in our world. For Your glory. In Jesus powerful name, Amen.